By David Siddle, M.Eng., and John Scholte, P.Eng. Waterside development in a major city is likely to be desirable, particularly when it is adjacent to a former Olympic site that has since been transformed into a thriving recreational and sport centre. In the Vancouver suburb of Richmond, these two opportunities were presented along with significant underground challenges for Aspac Development—the developers of the new high-rise residential waterfront community, River Green. The site’s location—right on the Fraser River—and the presence of coarse-grained sands onsite, meant the high water table would likely require considerable pumping to dewater the excavation. While the pumping itself is costly and has potential to interfere with construction, the bigger issue had to do with the possibility of dewatering-induced settlement of the area around the excavation, affecting nearby roads and buildings. Right next door to the River Green site is the Richmond Olympic Oval, built for speed-skating and other events of the 2010 Olympic and Paralympic Winter Games. (For more on this topic, click here) This building is now a popular fitness, recreation, social, and competitive facility. City authorities were monitoring the construction at River Green closely to be sure that there would be no significant impacts to the structural or cosmetic integrity of the massive Oval. The means by which concerns about potential settlement of the adjacent structures were dealt with point to some useful lessons on how to apply cutter soil mixing—an innovative technology starting to see greater applications across North America. 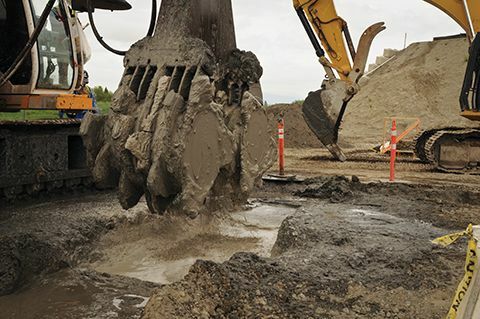 Traditional excavation shoring and dewatering techniques often include the use of a structural shoring element, combined with well points or dewatering sumps to control groundwater inflows. For the large majority of excavation sites, these conventional methods are tried-and-true and cost-effective. In the Richmond area (and other locations with similar characteristics), the presence of a high water table and the extensive deposit of granular soils make the use of conventional methods problematic for deeper excavations. The drawdown of groundwater can cause settlement of structures in the vicinity of the excavation resulting in cracking and slumping of buildings and infrastructure. Often, the challenges and risks associated these deeper excavations make the inclusion of large underground parking structures impractical, despite the value the underground parking would add to a building project. The two sets of spinning wheels of the cutter head are pulled from the soil, on the piledriver, after mixing soil to the designated depth to construct part of the cut-off wall. One option to eliminate dewatering-induced settlement is to reduce the amount of dewatering necessary in the first place. By minimizing the amount of water entering the sides and base of the excavation, the drawdown effect and potential impacts to surrounding structures are also reduced. A hybrid solution that included both a structural shoring element and deep cut-off wall was proposed for the site, with cutter soil mixing deemed to be the ideal technology for the project. The CSM method, developed from cutter technology, makes use of two sets of cutting wheels that rotate about a horizontal axis to produce rectangular panels of treated soil. It employs a track-mounted, mobile piledriving machine with a vertical mast up to about 30 m (100 ft) in height to insert a mixing/cutter head into the ground while injecting and mixing slurry of bentonite, grout, and cement with the in-situ soil. After the cutter reaches the target depth of up to 30 m below surface, cement slurry is injected down the shaft. As the cutter’s wheels are pulled back toward the surface, they continue to spin, mixing the cement into the soil to create a column of soil-cement mixture. A continuous wall is formed by a series of overlapping primary and secondary panels. When properly built, the cured soil-cement forms a low permeability cutoff wall that also has significant structural strength, helping form a retaining wall for the excavation. For the River Green project, the combined cutoff and retaining wall extended 350 m (1150 ft) around the property and to a depth of 28 m (92 ft) below existing ground. To provide the necessary structural support to the shoring component of the wall, H-pile reinforcement was added to the CSM panels at regular intervals in the upper 13 m (43 ft) of wall. CSM technology allowed the wall to be built in a narrow footprint—650 mm (26 in.) in width—to maximize the property available for development. 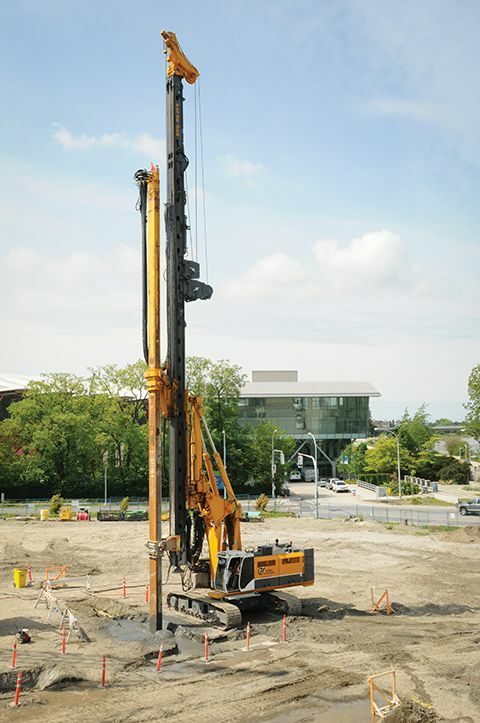 The equipment used for the work has a low noise impact, and is nearly vibration-free (a huge advantage over the alternative of driving sheet piles), which reduced inconvenience to neighbouring stakeholders, as well as vibration damage to the Richmond Olympic Oval.